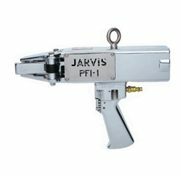 The Jarvis Model PFI-1 – pneumatically powered picking finger installer. More versatile than finger installers – will install any shape finger up to 5.5 in (140 mm) long. More maneuverable – nearly 3 inches (76 mm) shorter than competitive models. More durable – finger clamps operate on rollers to prevent wear. Clamps individually mounted for double pulling strength. No piston springs – air power both directions.